“How did it all get away from me?” A lot of folks who have enjoyed success in their careers find themselves at some point asking this question. They were dreamers, builders, doers, creative, innovative and always operating with a bias toward action. But something happened. They got complacent. They had been warriors in their fields. Now they are domesticated. Possibly the greatest movie of my generation – I know the title leaps into your mind – is Rocky III. In the movie, Mr. T plays the character Clubber Lang. He is the number 1 challenger to Rocky’s title. But Rocky’s trainer, Mick keeps Rocky fighting lesser opponents to insure he will retain the crown. When Rocky finds out about what Mick is doing, he asks him why he would do such a thing. Mick says, “The worst thing happened to you that can happen to a fighter. You got civilized.” And for Rocky, the hallmark characteristic of this civilizing effect was that he had become complacent. It happens to leaders and organizations too. Once unstoppable, they now seem unable to keep pace with world around them, and irrelevancy starts to loom. So why does this happen? 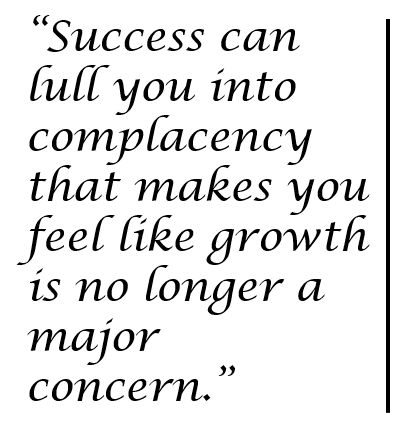 How do leaders and organizations become complacent? Let’s look at what I think are the top five reasons that I have observed over time. You made it! You worked hard, dreamed big, launched out, risked it all and it paid off, big time! And then you went into maintenance mode. What you built needed to be sustained and preserved. On the road to success, your efforts were all about growth, but now they have become about the destination at which you have arrived. Now, the things you do in maintenance mode to preserve your place and status are not the things that produce success. They produce complacency. You begin to think, “I don’t need to innovate, dream and create any longer. I don’t need to take big risks. I need to play it safe and hold on to what I have established.” And the success you have achieved makes that seem rational. Success makes you feel like you have arrived at your destination, and no further growth is needed. You become complacent. The problem is, if you are not growing as a leader, or as an organization – and growth can be and measured many ways – but if you are not growing, you are dying. 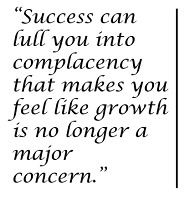 Success can lull you into complacency that makes you feel like growth is no longer a major concern. And it’s not just the success that is hypnotizing. It is the stuff that comes with it. Money, buildings, physical resources, key relationships. I have worked in churches most of my adult life. One of the biggest obstacles to church leaders recognizing their own complacency and the demise it is causing is a large, beautiful church building that was constructed during a growth period. Other businesses can fall into the same trap. We have this incredible facility and office suite and warehouse with all the latest systems in place to help us stay on top of our world. We’ve got it. But you’re losing it because you are complacent and no longer doing what got you the stuff. After you have fallen into complacency, other manifestations of your dysfunction will appear to insure you stay there. One of those is the curse of low expectations. When complacency takes root, leaders and organizations make a mental shift. Because they have abandoned healthy growth practices, they cannot hit the kinds of high benchmarks they used to set for themselves. So they shoot lower. And they redraw the bullseye to make it quite a bit larger and easier to hit. And for a lot of folks falling into complacency, low expectations lead to unclear goals. Sometimes they begin to adopt a strategy and set of tactics simply because they are easy to hit, and not because the serve any vision or mission. So leaders, or entire organizations can be quite busy doing things that go nowhere precisely because they do not really know where they are going. One strategy used to prevent complacency is a strong, healthy, clear and highly encouraged feedback system. So if complacency is going to thrive, feedback systems will need to be deconstructed and rebuilt to support the complacency. This is quite common. In a flawed feedback system, you never ask for the feedback of those are still in growth mode. You will need to hide from these people. Don’t read their articles. Don’t let your employees discover who they are or begin conversations with them. If you have any growth-minded people left in your organization, make life miserable for them so they will quit. Only seek out the feedback of those who think the problem is not with them, the leadership, the lack of vision or the system, but with their market, or environment, or the culture, or location, or facility, or the competition or anything else on the planet but them! Complacency must be protected from ruthlessly honest self-reflection and assessment. This is the guarantor or complacency. No hard conversations. No uncomfortable truth. No critical self-reflection. No honest seeking of outside wisdom and help that may prove painful to hear. No risk of confronting complicity in demise. Feelings might get hurt. Relationships might be strained. Of course, a healthy healing period and recovery might be just around the corner, but why would we want that when we can avoid discomfort and just slowly die? The desire to get along at the expense of good health is like anesthesia, and it is so easy to overdose on the stuff. So how does a leader cure complacency in herself or her organization? Intuitively, it is simply by doing the opposite of that it takes to build complacency. No lengthy commentary needed. See success as the process of growth, rather than as a destination. Never be tied to your stuff. It is supposed to serve you. You do not serve it. Make your goals crystal clear, repeat them often and set your expectations high. Get around people who will tell you hard truth, and treat them like gold. Tell others hard truth when needed, and always with grace, focusing on your shared vision. See?! Simple. Not easy. But simple.